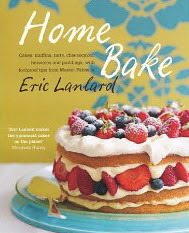 Home Bake - A lovely cakey-pastry book by Eric Lanlard from the T.V show Glamour Puds. He is a french born chef who lives and works in London, and so I'm hoping his Macaron recipe might produce something close the the ones I had in Selfridges. The recipe looks pretty much the same as others I've tried, except it calls for the egg white to be weighed out, and not added by number. I really like how the whole book is set out, with step by step pictures followed by a large image of the finished recipe. The photographs are very honest, and I like that, it stops you feeling intimidated by something you think you could never achieve. Lets hope they turn out ok!